I have been cleaning out everything I don't need in my room and it has been bringing back so many memories of when I was in elementary school, you wouldn't believe.I have like three diaries, and I read like every page I wrote, from 1997 to 2007, and its crazy the things I said and how it just triggers a thing in your brain that brings you right back to that point in time. I just love it, because of course you have pictures to remind you of events that occured in the past, but a diary or a journal actually tells what happened on a specific day in your past. I mean it is so funny how we think about the past and the present and the future in our lives, but I mean we are living in the furture right now, because when we were kids we thought about this point in time. Five minutes ago was our past and right now is our present and future, if you think about it. But there also is your future in the long run. 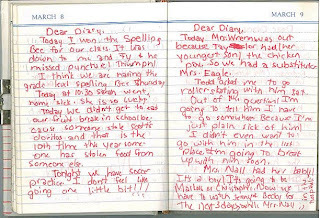 Anyway, I just think that is so interesting how that all works, and how it just came to me when I flipped open a diary. Time just flies by and the fact that you have journaled just shows that blink of time..
your blog and my moms blog are about nostalgia... did you guys plan this? haha thanks mary, nope we didn't plan it, lol. Like vince said, I think I should take a philosophy class, its on my uc transfer thing anyway. I never had luck keeping a diary. I tried a couple times, then lost interest. Then when I would go back and read what I had written it was like, "Today I ate some grapes, then I read a book." Yeah, about that exciting. Anyway, it is cool you can do it, you should keep that up, it is a good way of trying to slow down time. Which moves so so so fast. I am way to paranoid of a person to keep a good journal. The ones I have kept in the past have all been thrown away, which really is too bad. Even if I could keep them safe and unread while I was alive, I was always too afraid someone would read them when I am dead. Is that weird?!? !